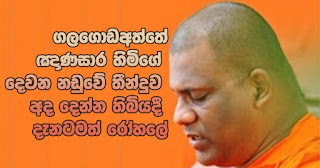 Galagodaaththe thero's judgement of second case due today ... thero already in hospital! Judgement on the case submitted to court against general secretary of Bodu Bala Senava organisation on the offence of contempt of court is to be pronounced today (8) by Appeal Court. abducted and made to disappear were produced in magistrate court, in which instance on January 25th, 2016 the respondent Galagodaaththe Gnanasara thero had entered court by force and had addressed court. The respondent Gnasnasara thero had barged into court and had remarked that he is not prepared to fall in line with 'sudda's law' and to release the soldiers and had gone further in addressing Deputy Solicitor General Mr. Dileepa Pieris who directed proceedings of the petition in a degrading manner. Appeal Courts which considered a petition by Mr. Ranga Dissanayaka who functioned as Homagama magistrate at that time submitted a petition to inquire whether there had been an instance of contempt of court and to take action against respondent Gnanasara thero by filing legal action against him for the offence of contempt of court. According to those orders the attorney general had summoned evidence in relation to the case against Gnanasara thero in respect of four charges which were inquired by president of Appeal Court, judge P. Padman Surasena and Shiran Gunaratna of the bench of judges and the verdict in that connection was expected to be released today as decided upon last 18th. Prior to this, Gnanasara thero had to stay behind bars for a period of two weeks for having disgraced Prageeth Ekneligoda's wife. In the meantime, when the date has been fixed for the second judgement today, doctors have notified that Gnanasara thero who is already admitted himself to Sri Jayawardenepura Hospital on the 6th midnight day-before-yesterday is suffering from ailments related to the urethra and kidneys. What doctors say is that an operation should be performed on him today 8th. As such, if the thero is to be imprisoned once more according to the verdict, he would nevertheless get the opportunity of staying right along in hospital.